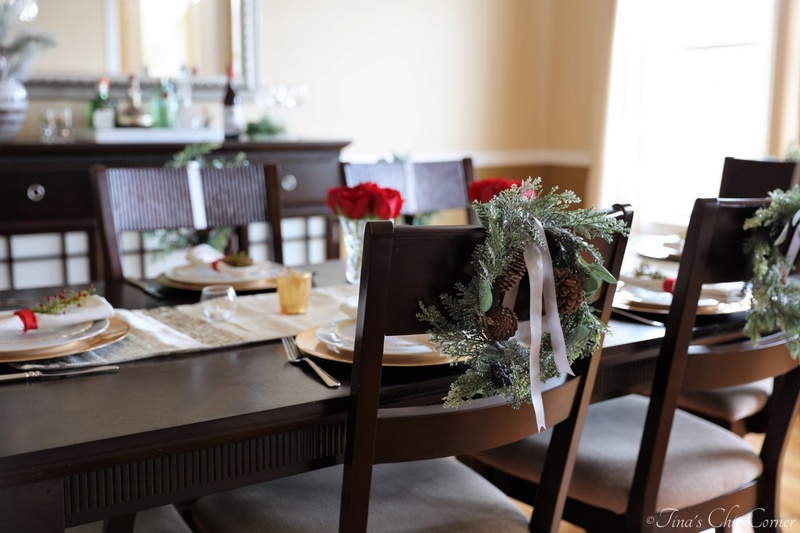 My husband and I host some dinner parties for family and friends during the holidays. There’s something special about sharing our home when it’s decorated for Christmas. 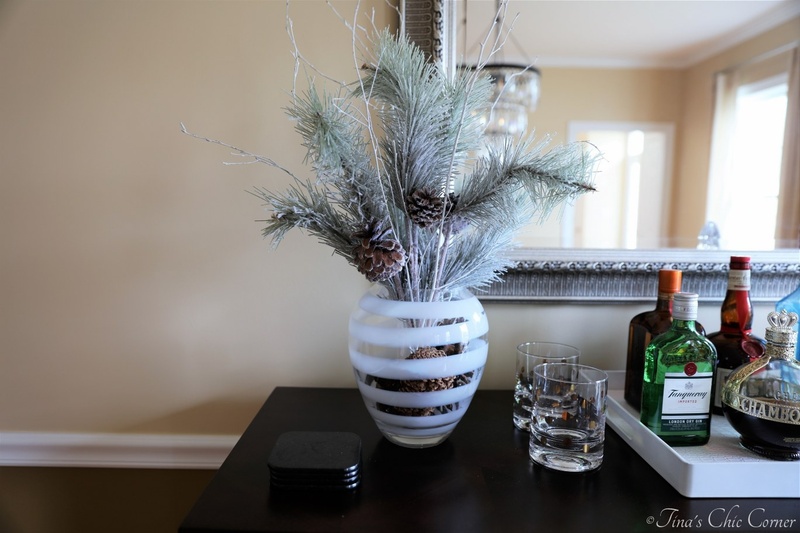 I’ve recently shared with you how we decorated our bedroom, family room and foyer so now I’ll share the with you the room that we do most of our entertaining in. 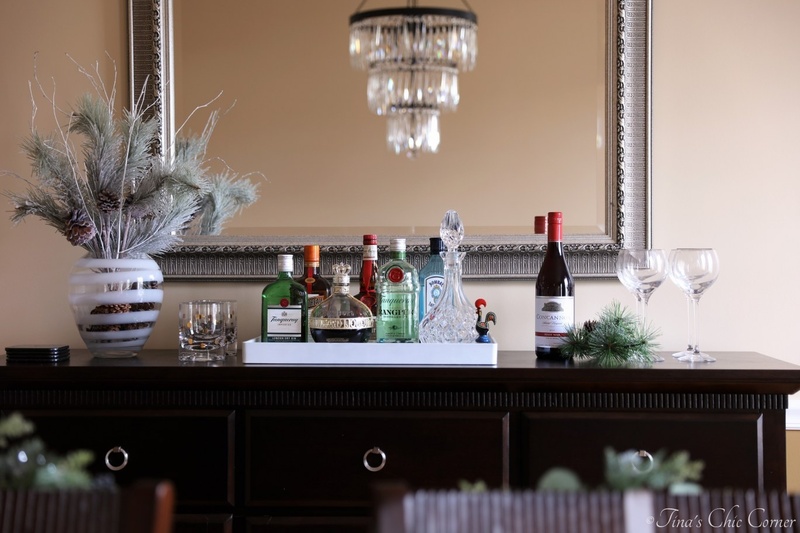 I decorated the bar area with a few touches of wintry items which can even stay out after Christmas. Last year I used live wreaths on the back of the two end chairs at the dining room table, but that proved to be messy as they dried out. This year I decided to use faux wreaths on every chair. I cannot even begin to tell you how long it took me to hang them at just the right spot. Seriously, hours of my life that I will never get back. I might have had a temper tantrum and thrown a couple of wreaths on the ground, which only really made things worse because I had more to clean up the glitter that fell off them. They might just stay up all year long. 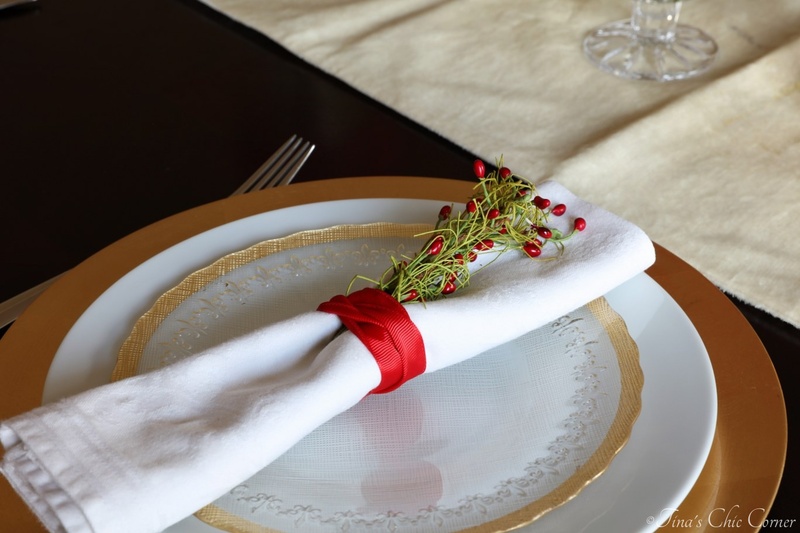 Earlier this month I used a red, cream and gold theme for the table. 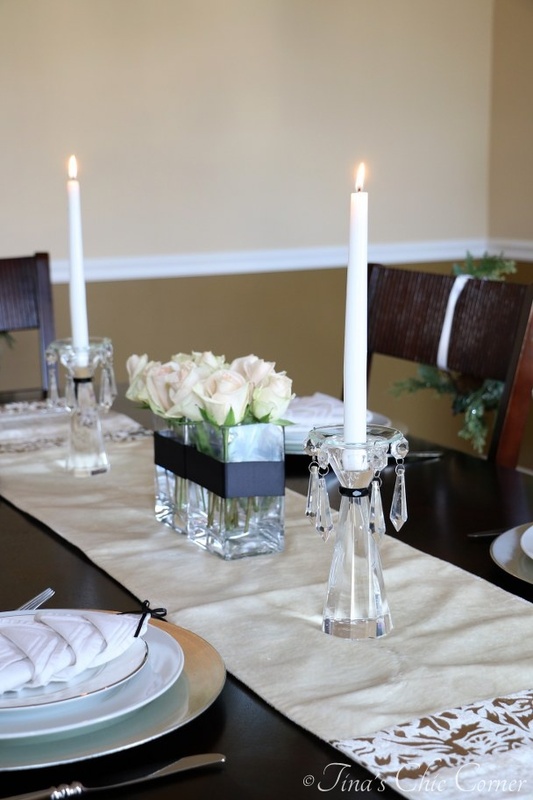 I like to keep the decor low to the table so that I can see the people across from me. There’s nothing quite as annoying as seeing friends you only see once a year and then not being able to actually see them as you talk to them. I love how the plate settings turned out. Last weekend I switched it up and used a white, black and silver theme for the table. Can you tell that I love to use flowers for my center piece? 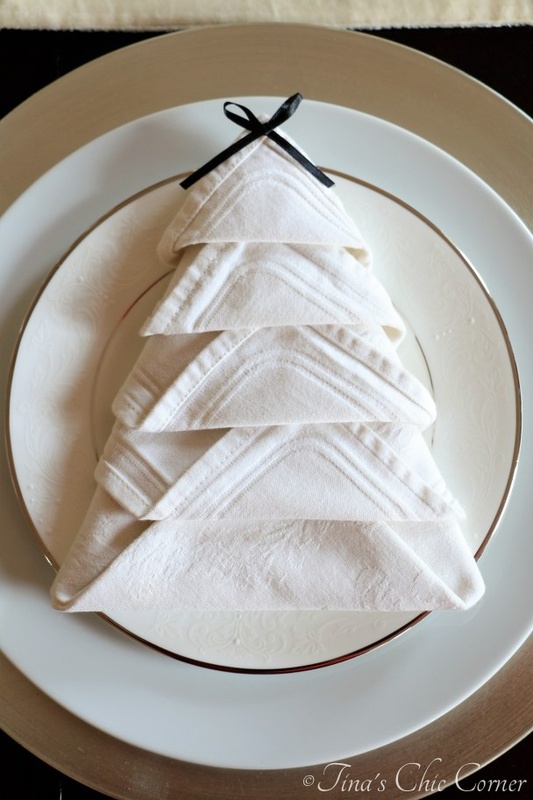 Do you like my attempt at napkin oragami? You can find an easy step by step tutorial when you click here. Here’s one more look that I wanted to share with you. 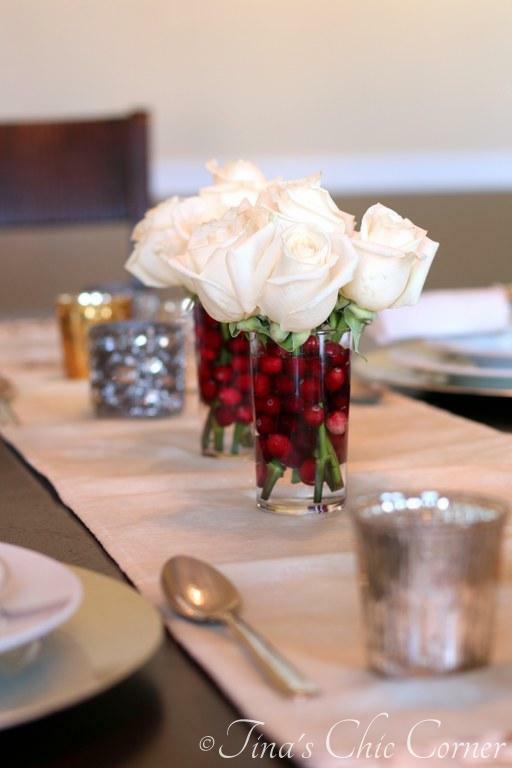 I love, love, love white roses with fresh cranberries. I actually took this shot a couple of years ago but I’ve used this theme countless times because it’s my absolute favorite. 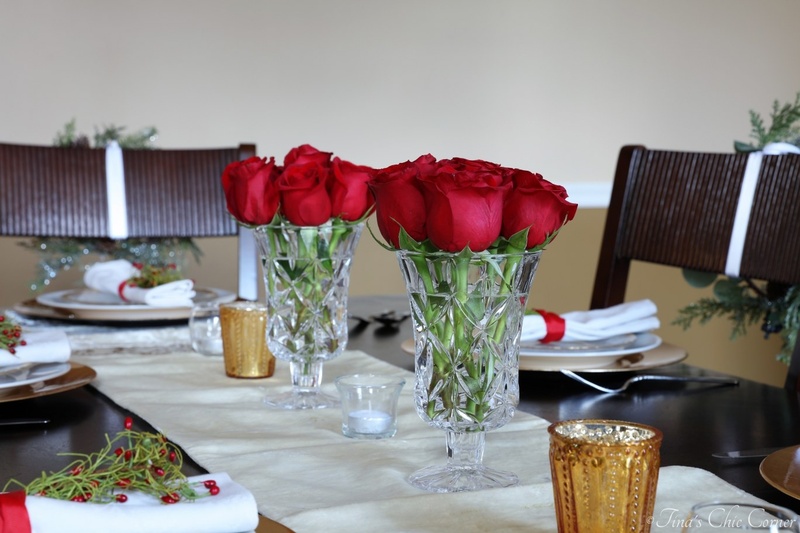 I hope that I’ve given you some good ideas if you’re entertaining this holiday season!